I have been home for 4 days and have had little time to rest (let alone clean my house) before packing up for a trip I am taking for 7gypsies. My husband is going along as my traveling companion this time and really it's the first time he has ever traveled with me into scrapbook world, so this should be interesting. The only reason he would take the time off work in the school year is the sheer fact that I am teaching here. Cool right? Deb and I taught there in 2007 and had the most fabulous time so I am excited for him to be able to go with me. So what does a girl do who had little or no time to get the final things accomplished before setting out tomorrow night? rash; ill-judged : a harebrained scheme. Last week I came up with a hare-brained scheme to make something to give away in each of the 6 classes I am teaching. I thought of a tote bag at first but settled on aprons. I ordered the aprons on Monday night when I was at Debs house from here. Super, super cheap but great quality (I was pleasantly surprised). The company is located in San Francisco so the aprons were on my doorstep when I arrived home on Thursday night (after a darn 3 hour plane delay in PHX!) Debbie kept reminding me, "at least you're in air conditioning!". Thank goodness. I used scraps of fabric that I have saved from various projects. Some fabric I have never even used like the pink bird print that I was going to use to make a lamp shade back in the 90's (still love the fabric though) but I digress, I added trims and vintage lace, buttons and some stamping. Each of the 6 aprons are different, I am not very good at making the same thing over and over. My one stipulation was that they each had to be sewn with creme thread so I didn't have to keep changing the bobbin. I used Thermoweb Heat n Bond (Walmart) to adhere the fabric in place before sewing...sometimes I turned the edges under and sometimes not. I really just did what looked good to me. The biggest challenge was decorating the pocket since it is sewn in three sections. It took a bit of thinking but I figured out how I could stitch over the same seams and no one would be none the wiser. For the stamping I used Ranger Archival Ink in black and coffee (my favorite color) since it's waterproof, then heat set it just because it makes me feel better. I didn't photograph each apron, just the details of each. Some I like better than others...some colors speak more to my sensibilities and some have words that I thought people might like. ps) Christmas is a coming...I'm just saying. The yellow fabric was left over from covering shades for the chandelier over my kitchen table. And the blue fabric is one of my all time favorites...just one small fat quarter left. I ironed HeatnBond onto the creme fabric, turned it over and traced the butterfly on the backing paper using a chipboard cutout. I cutout the butterfly then ironed it on the apron and stitched around the edge. Faux yellow pocket sewn right on the large front pocket. I stitched the trim on by hand so the pocket is still usable. So now I am laughing because I just realized the large rose fabric is from yet another lamp shade I made a million years ago. You may notice the 7 tab? I decided to give a nod to 7gypsies by creating a tab made from twill tape and stitching it into some part of the apron. Bird stamp - Cavallini. Some lace I picked up a Farm Chicks back in June. No lampshade fabric here, just fabric I like. I picked up this stamp at the ever fabulous Red Lead Studio. On the side of this apron I stitched part of a hankie to mimic a pocket. What I love about the delicate hankie is that the owner wrote their last name in permanent marker. I decided to stamp each of the aprons so the winner might remember it came from this event. Because it is a clear stamp I was able to curve the stamp on the acrylic block to follow the edge of the apron. Word stamp - October Afternoon, Number stamp - 7gypsies (love this stamp because it has large numbers down to tiny ones! Arrive Johannesburg 5:20 pm THE NEXT DAY! After 31 hours of travel. Oh, lordy! 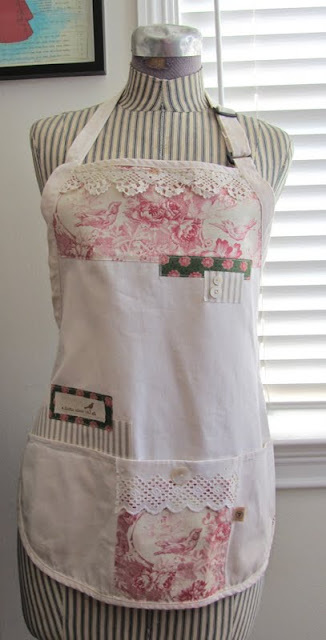 someone will be very happy to get this,-your apron is very beautiful-I love the bird fabric- and all your details. Oh, what a beutiful apron, love it! It would be far less travel time to come to St Pete and Whim So Doodle!! And we'd LOVE to receive an apron *when* you do come visit! The aprons came out great! Have a safe trip and enjoy! Those are just sooo darling!! Have a blast on your trip!! What I would give for one of those cute aprons but I'd give even more for a trip to S. Africa. Have a great class. Wish I was there. The aprons look adorable --I love the variety of textures and all the details. I'm sure they will be well-loved! Hope you have safe travels and a delightful time! Talk about adorable aprons, there could be a mass riot in the hopes of winning one in the classes. Please show the whole aprons. They're great. LOVE your aprons, some girls are going to be very lucky!! When you come back will you explain how you sewed on the already sewn pocket? Enjoy your trip and hope your hubs does too! Yay! I hope I am one of the winners! I look forward to your class in Cape Town! Have a wonderful trip. Lucky participants! Beautiful aprons, made with love! What a great idea and very economical also. You did a lovely job on them and whoever wins will be lucky.